Christina McMillan was born at Greenock, in Scotland, 9-11-1836, she married John McCallum in Brighton, Victoria, Australia on the 13th November 1866. Archibald McMillan and Katherine McTaggert were a Kintyre family who moved from Clonaig to Australia with their ten children: Neil, William Kay, Peter, John, Duncan, Alexander, Archibald, Gilbert, Godfrey & Christina. They emigrated to Australia on the "David Clark" in 1839. Archibald's parents were Peter McMillan (d. June 1829, 88y) and Christina Taylor, (d. 1801 41y) who are buried in the graveyard at Kilbrannon, Skipness in Scotland. John McCallum married Christina McMillan (b. 9-11-1836) on the 13 of November 1866 at the home of her parents, "Clonaig" in Brighton, Victoria. He was a clipper captain and had sailed for most of his career up until that time on "Yankee" ships. In 1863 he was in command of the "Andrew Jackson", which was sold to Scottish ownership. His brother, William S. Johnson had commanded the ship for the previous three years while John had commanded the S. Gilderslieve which had been sunk by the Confederate warship "Alabama". John sailed the "Andrew Jackson" to New Zealand with emigrants a couple of times. Written by Janet Smith about 1960 regarding Christina. "... he sailed to Melbourne, and there married in 1866 Christina McMillan, the only daughter with seven brothers who had emigrated from his native Kintyre. They sailed to Glasgow and when there Christine was taken to Sighthill Cemetary to visit the grave of her husband's parents. She expressed a wish to be buried there. It must have been a much more attractive place than it was later when I knew it first: with Glasgow smoke and sulpherous fumes falling on it, it looked blighted. They sailed for Shanghai, and on the way Christina was found at the bottom of the poop steps badly injured. She lived for three or four months and when a baby was born she died. The baby also died. In order to fulfil her wish, the coffin was crated and loaded into the ship with the rest of the cargo. The crew did not know that a dead body was there but the well known superstition that a ship with a corpse on board was doomed actually happened. The Andrew Jackson struck on an uncharted reef in the Sunda Straits, and became a total wreck. Captain McCallum managed to reach Batavia (Jakarta) in the ships boat, and returned to salvage the cargo and the coffin and personal belongings. Christina was buried in Sighthill Cemetary as she had wished in 1867. Being one of eight children and of Highland extraction she may have been the seventh child with second sight who could foretell her own end or it may have been the fashionable Victorian obsession with death." Christina's body was interred at Sighthill Cemetery, Glasgow. 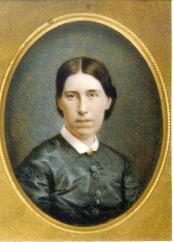 Christina was described as "rather a plain woman but with good features". The McMillan's had done well and this is reflected in the quality of the wedding presents which still survive, most of them with "C McC" engraved on them. Well finished mahogany boxes were made by the ship's carpenter for the silver, which included a fine decanter set and an engraved glass fruit dish on an ornate silver stand. These were left to Ian and Helen McCallum (Lee) by their parents, and are listed in the Family Heirlooms document. "Presented as an affectionate and loving remembrance to her daughter Christina by her Mother on the day of her Marriage at her residence, Clonaig, Brighton, Victoria, Australia 13th day of November 1866. And it is the sincere wish and prayer of her mother that she may be guided through life by the study of the law of God in this blessed book, And that the blessing of God may even attend her." Peter McMillan died June 1829 aged 88 years.